The Acer Iconia Tab A500-10S16u is a great tablet that allows you to enjoy media such as streaming videos in greater detail with its 10.1″ touchscreen. The NVIDIA GeForce GPU coupled with an NVIDIA Tegra 2 Dual-Core Mobile Processor makes this tablet an absolute media workhorse. Having 2 standard size USB ports is a rare feature on Androids and makes it different than nearly all other tablets. 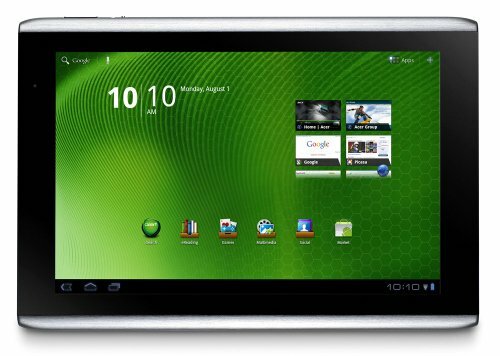 The only other Android tablets we are aware of with multiple standard size USB’s is the Acer 200 and the Dragon Touch R10. You can view your screen in either landscape or portrait mode and you can see what you are looking at from every viewing angle. The built-in 802.11b/g/n Wireless access gives you the ability to enjoy streaming media anywhere you have access to WiFi. You can even hook it up to your television via the Micro HDMI™ Out port available on this tablet and enjoy up to 1080p HD video. The tablet includes 2 cameras to allow you greater flexibility in how you capture images. You can use the 5MP Rear Facing Camera with Auto Focus and single LED flash to capture those unexpected moments in life that you don’t have a camera handy for. While using the 2MP Front Facing Camera you can chat with friends via the internet thanks to the built-in dual analogue microphone. You can even use the front facing camera to take self-portraits that are perfect for your social network profile pictures. The Iconia Tab A500 is also capable of taking and storing videos. With 16GB of onboard eMMC memory and the ability to use an additional MicroSD card up to 32GB, you can store enough pictures, videos, movies, and music to keep you entertained for hours. The 8-hour battery life is great so that you can take all of this entertainment on the go with you and never miss a beat. Google Play store will give you access to countless apps that you can download to increase your enjoyment. The tablet comes preloaded with the Android Honeycomb operating system and tons of great applications. From Instagram and Facebook to Netflix the amazing apps that are available for this tablet will never cease to amaze you. It also includes Acer Sync that allows easy Synching between your tablet and your PC. From an aesthetic point of view, you will not be disappointed. This is an absolutely beautiful tablet that will have your friends wishing that they hadn’t spent so much more to get a plain looking tablet. It comes with an impressive aluminium casing that not only looks great, it feels great too. The smooth-edged, rounded corners ensure that you will always be comfortable when holding your tablet in your hands. Overall, the Iconia Tab A500 is a great value that is packed with tons of user-friendly features. It is easy to use, beautiful to look at and the designers really did try to anticipate everything you could hope to do with your tablet. The large screen and expandable memory make it a great choice for people who enjoy media of any sort on their tablet.